Brazil international midfielder Paulinho has rejoined Chinese Super League club Guangzhou Evergrande on loan from Barcelona, only 12 months after moving to Camp Nou. The 29-year-old’s swift return to China is a surprise, after an impressive season in Spain that saw him register nine goals and two assists in 34 La Liga appearances as Barcelona won the title and cement his place as a key figure in Brazil’s starting XI under Tite, his former manager at Corinthians. Guangzhou have an option to make Paulinho’s loan a permanent move next summer, reportedly for around 50 million euros, while releasing him also allows Barcelona to free up one of their three allotted non-EU player squad slots. They have already agreed terms on a deal for Gremio playmaker Arthur and have been linked with a lucrative bid for Chelsea winger Willian. Returning to China is the latest unexpected twist in an unusual career for Paulinho, who turns 30 later this month. His first attempt to make an impact in European football in Lithuania and Poland with FC Vilnius and LKS Lodz respectively ended in failure as a teenager, and it wasn’t until he signed for Corinthians in 2010 that he attracted wider attention and broke into the Brazil squad. Tottenham paid £17m to bring him to England in the summer of 2013 but Paulinho was underwhelming in the Premier League, failing to hold down a regular starting spot in his two seasons at White Hart Lane before leaving European football for Guangzhou in June 2015. 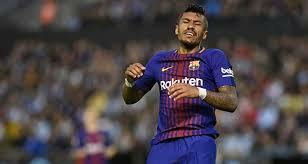 Paulinho won six trophies in three years at Guangzhou, claiming back-to-back Chinese Super League titles as well as lifting the Asian Champions League in 2015, but eyebrows were raised by Barcelona’s decision to activate the €40m release clause in his contract to bring him to Camp Nou last summer. There he emerged as an influential midfield cog in Ernesto Valverde’s team, winning the Copa Del Rey as well as securing the league title by a comfortable 14-point margin over Atletico Madrid.